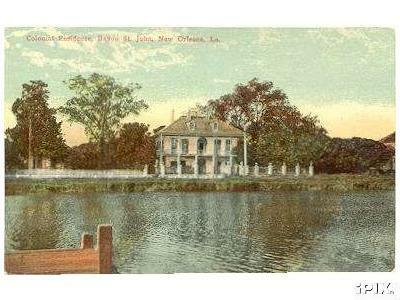 1903 Postcard 'Evening on Bayou St. John New Orleans'. Historic Marker for Bayou St. John. On March 9, our Indian guide points out a fine path-which leads to a small bayou we will call Bayou St. Jean. He tells us that the Indians use this path and bayou to travel from the Mississippi River to a lake Iberville will call Pontchartrain. When the French missionary Father DuRu later visits this area, he notes, 'There are parrots by the thousands; their plumage is marvelous, but they are far from being as good (to eat) as they are beautiful.' Later we will settle this site because of its path/bayou connection between the river and Lake Pontchartrain. We will call it New Orleans. Linen postcard showing evening on Bayou St. John in New Orleans, La. Copyright 1903 by Detroit Photographic Co. 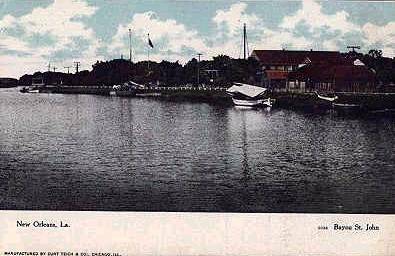 Description: Scene on Bayou St. John, including houses in the background. 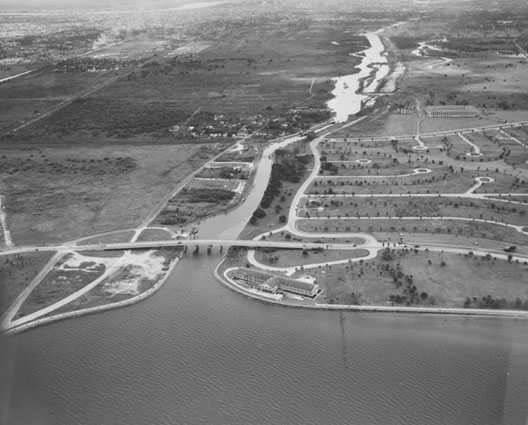 Bayou St. John meets the Lake, probably 1948. 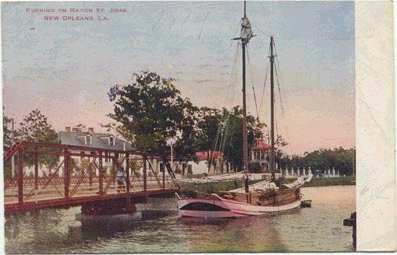 On the right of the old bridge is the Coast Guard Station (now gone) and the area known as the 'Old Beach,' the original home of Pontchartrain Beach. Above the Old Beach is Lake Vista, after the streets were built, but before homes went up. At the right of the Bayou is open ground which became Lake Terrace. Bayou St. John (New Orleans, Louisiana) is the remnant of a natural navigable waterway which once connected Lake Pontchartrain and the Mississippi River. The area was originally inhabited by the Chapitoulas Indians. However, they were gone by the time the French arrived. The Choctaw Indians used the Bayou as a travel and trade route for many years prior to the arrival of the French. In 1699, the Choctaw showed the French how to reach the area now known as New Orleans without having to traverse the dangerous and mostly uncharted Mississippi River. The original route started at the Gulf of Mexico and went through the Manchac Bayou (once called the Ascantia River), then through Lake Maurepas, then into Lake Pontchartrain to a stream on the south shore of the lake which the Indians called Choupicatcha (also reported as Tchoupic). In Choctaw this word means mudfish. The name Tchoupic (pronounced shoe-pick) is still used to describe a popular local fish in the region. The French named this stream Bayou St. John in honor of the patron saint.Later trips by the French followed a different rout from the Gulf of Mexico. The new route went through Lake Borgne, the Rigolets Pass, then Lake Pontchartrain to Bayou St. John. Upon traveling up this bayou, one reached a terminus still located near the current intersection of DeSoto Street and Lafitte Street. From there, a portage of about 2 miles through dense forest and marsh brought one to the Mississippi River. The French began using the new route for trade. As early as 1703 (15 years before the founding of New Orleans), the Bayou was used as a shipping channel for French trappers and traders who lived on the Bayou. Prior to the arrival of the French, a Choctaw Indian village of the Houmas tribe existed at the headwaters of the Bayou. They had probably already relocated to what is now called Houma, Louisiana by the time the French arrived. The French established a landing at the headwaters and named it Port St. John when the City of New Orleans was established. A route to the new City on the river was cleared and named Grand Route St. John. A street bearing this name still exist to memorialize this route. In 1701, the French constructed a fortress near the mouth of the Bayou. Under Spanish rule in 1779, the fort was rebuilt and became known as Spanish Fort. Remnants of the structure still exist. Local folklore says that the voodoo queen, Marie Laveau, performed voodoo at the mouth of Bayou St. John on Lake Pontchartrain. 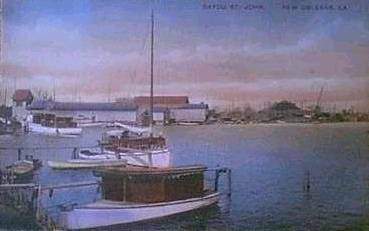 Bayou St. John was fundamental to the early life of New Orleans. In 1803 a canal was dredged from the Bayou toward the City's heart. This new canal terminated at current day Basin Street named for the ship turning basin at the terminus of the canal. This canal was originally called the Carondelet Canal in honor of the Spanish governor of that name. In 1838, a new canal under American control was dredged from Lake Pontchartrain into the City. The new canal was known as the New Basin Canal. 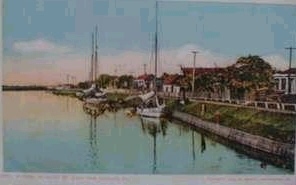 The Carondelet Canal became known as the Old Basin Canal and remained primarily under the control of the Creoles. 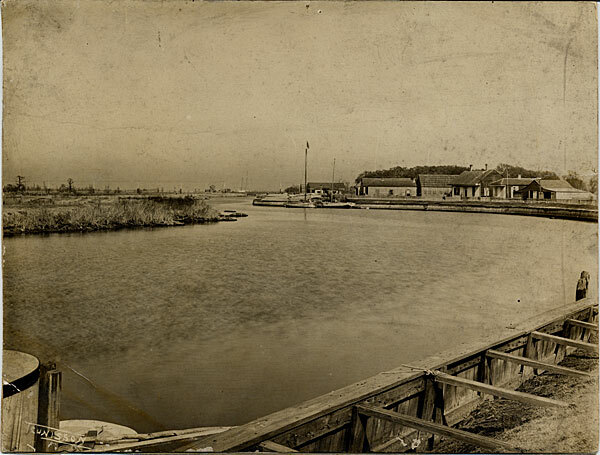 Bayou St. John and the Old Basin Canal became commercially less important. The Bayou has not been navigable for the better part of this century. Construction of vehicular bridges and changes in commerce during this century have rendered the Bayou unsuitable for water traffic except for very small canoes and skiffs. 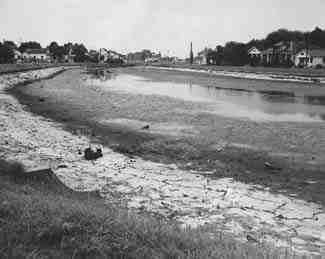 Bayou St. John is in the judgement of many geoligist, believed to be the result of a geological fault or fracture in the ground surface since it is bankless. When the French arrived in Louisiana, Bayou St. John was connected to Bayou Sauvage and Bayou Metairie. Some beleive that Bayou Metairie and Bayou Gentilly-Sauvage flowed as one stream originally. These connections do not exist today. The Bayous have not been connected to the Mississippi River in modern times due to natural geologic evolution. Also, Bayou St. John is no longer directly connected to Lake Pontchartrain. A manmade control structure existed just south of what is now Robert E. Lee Boulevard until 1960. At that time, Robert E. Lee Boulevard was constructed and a new 'water fall' control structure was constructed just north of the roadway. This structure regulated the flow of water from Lake Pontchartrain into the Bayou. This flow was necessary to maintain the ecosystem. The Bayou is not tidal today. The Bayou has a length of less than 5 miles, an average width of 200 feet, and a maximum depth of 9 feet. The Bayou is not part of the New Orleans Sewerage and Water Board’s stormwater drainage collection and storage system as the only rainfall it receives is that which falls directly on the water surface and on the immediately adjacent banks. In fact, the Sewerage and Water Board does not own or maintain the Bayou. The Sewerage and Water Board allows water to flow through three (3) controlled outfalls into the City's stormwater drainage system. The outfalls are located at the Orleans Avenue canal, the Lafitte Street canal and the Florida Avenue canal. The Orleans Avenue canal outfall is normally maintained in the open position. The other two outfalls are normally in the closed position. The outfalls are not capable of draining the Bayou only maintaining the surface water elevation within an approximate range of (-)1.0 ft. to (-)1.5 ft. below mean sea level. There also exist a drainage pump which can exchange water between Bayou St. John and the City Park Lagoons. In 1993, a new floodwall control gate was constructed by the Orleans Levee Board north of the Robert E. Lee Boulevard crossing. The floodwall gates remain normally closed. However, the gate contains sluice gates to allow water into the Bayou. The old Bayou 'water fall' control structure was then deactivated and remains in the open position. All inflow is now regulated by the new sluice gates. The Orleans Levee District controls the operation of the sluice gates. It is believed that Bayou St. John is owned by City Park. City Park has established rules for the use of the Bayou in regard to power boats and recreation. City Park also maintains pumps which allow for water to be pumped into and out of the Bayou into the City Park Lagoon system. Today, Bayou St. John is neither tidal nor controlled by fluctuations of the water surface in the Mississippi River. The water surface elevation is controlled by manmade pumps and control structures.